GOP gains are seen among both younger and older voters. Among the population as a whole, roughly half of voters under age 30 (52%) express support for the Democrats. This is a significant decline from 2008 when fully 60% of this group identified with or leaned toward the Democratic Party. The Democrats’ 28-point advantage among the under-30 cohort has fallen to a 14-point advantage. Among voters age 30 and older, the Democrats 10-point advantage in 2008 has shrunk to two points as of 2011. This pattern is echoed within several religious groups. In fact, among several religious groups, the move toward the GOP has been at least as large – if not more pronounced – among those under 30 as among those age 30 and older. In 2008, 67% of young white evangelicals aligned themselves with the GOP, giving the Republican Party a 41-point advantage among this group. In Pew Research Center polling conducted in 2011, 82% of white evangelicals under age 30 expressed support for the Republican Party, giving the GOP a 69-point advantage over the Democratic Party. Whereas in 2008 the partisanship of evangelicals under 30 closely resembled the partisanship of their older counterparts, young white evangelicals are now significantly more Republican in their partisanship than older white evangelicals. In 2008, roughly half of white Catholics under 30 called themselves Democrats or leaned toward the Democratic Party (53%), while 41% favored the GOP. By 2011, these figures were reversed, with 54% of young white Catholics favoring the GOP and 40% preferring the Democratic Party. 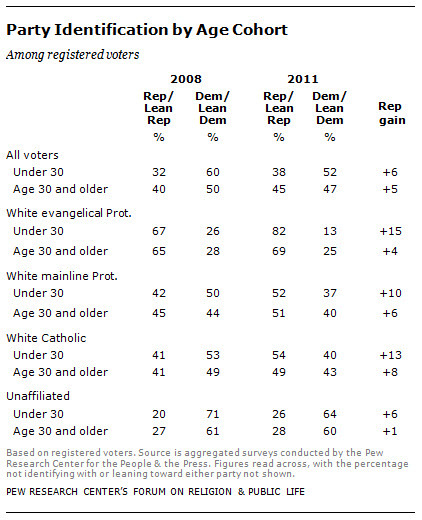 A similar decline in support for the Democratic Party is seen among white mainline Protestants under 30. Religiously unaffiliated voters under 30 continue to express majority support for the Democratic Party, but the Democratic advantage among this group has shrunk from 51 points in 2008 to 38 points in 2011.